It should not come as a shock that I like pretty things. Some of those pretty things are silver, mostly plated, and need polishing and maintenance every now and then. I don’t mind-it usually isn’t hard, just time consuming, and oh, so pretty and shiny when done! I keep a binder with loose-leaf paper, with each piece or set having its own page of when they were cleaned and polished, noting any damage that may exist on the piece. Few pieces in my collection are solid sterling silver-a couple of spoons and a salt and pepper set. However, each piece is treated as though they were genuine sterling silver, and people visiting always note how much they appreciate seeing the pieces, often going into stories of things they had, or their mothers and grandmothers had. I opt to clean with paste, Wright’s Silver Cream being my favorite. After cleaning off the tarnish, I wash each piece in warm, soapy water, rinse and dry with a soft cotton cloth right away to avoid water spots. You do not want water spots on your silver, whether sterling or plated. It is next to impossible to remove if allowed to dry. Most pieces are easy to clean, but some are as black as tar. For those pieces, I’ll be looking to send them off to a professional rather than try quick methods which do irreversible damage to pieces if used. I’m getting ready to clean my Grandma Mayer’s hostess set and a couple of other pieces I’ve put with the set. Yes, I use it by the way-that’s what it is for, not just sitting pretty on a sideboard or the table. Come back next week to see the results! 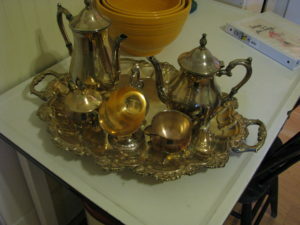 Grandma Mayer’s silver plated hostess set in bad need of a good cleaning!